The MF-UMSC facility opens from mid January 2019 to December 2019. We announce open time slots for different types of mesocosm experiments in 2019. 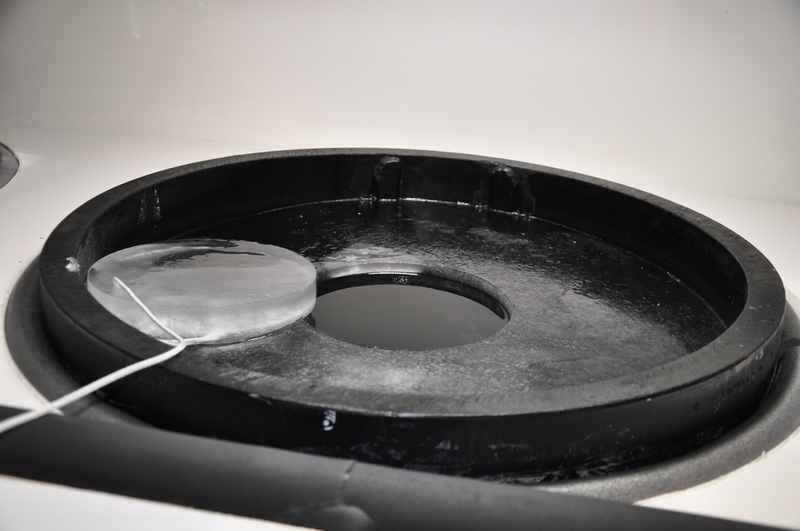 Projects can make use of the unique features of the mesocosms, including controlled convective stirring and stratification on the basis of temperature and/or salinity. The facility has now been further upgraded in order to harbor projects that includes freezing or thawing of ice at the water surface, which also allows for systematic seeding experiments. The new light sources are time controlled with near perfect spectra and intensity any time of year and any time of day. The ventilation ensures a natural CO2 concentration in the room, allowing for controls in studies focusing on the impact of an increased carbon dioxide content in the water. The facility is open all year around, and WP6 projects have highest priority. Some topics fits ongoing research at UMU, and projects can benefit from available local expertise. Even if we keep the topic open in general we prefer topics related to the research profile of our university. Examples of such topics are: – Land-sea interactions, including effects of dissolved organic matter, nutrients, metals and freshwater on the coastal zone. – Climate change scenarios testing for effects of temperature, changed hydrography (stratification, turbulence and mixing) on biology and chemistry. Transformation and propagation of Mercury, other metals, persistent organic pollutants and pharmaceuticals and their effect on the food web are also preferred themes. However, such projects require permission and/or equipment to get rid of the toxic substances, which mean that we cannot guarantee forehand that any such project can be performed. Studied objects are primarily part of the water column such as plankton, their biodiversity and major associated processes. However, mysids, smaller fish and natural bottom sediments can also be introduced in the mesocosms and subject to study. There´s currently no need for specific expertise/instrumentation. It will depend on what the specific project requires. We are open to both brackish water, marine and freshwater scientists from all disciplines. MF-UMSC offers open access to all infrastructure in the MF-UMSC for visiting scientists accepted through AQUACOSM TA activities. At least 280 person days for TA will be allocated to external users in 2019. We aim for 2 projects in 2019 with 4-8 participants. Visiting scientists can work on independent projects for up to 30 days, with the mesocosm hall and adjacent laboratories exclusively reserved. In addition, smaller groups are welcome to join other projects at MF-UMSC at any time. The MF-UMSC facility opens from January 2018 to December 2018. We announce open time slots for different types of mesocosm experiments in 2018. It is an advantage from our point of view if projects can make use of the unique features of the mesocosms (e.g. control of stratification and turbulence). Note that the ice capability will not be accessibly until the second half of 2018. The facility is open all year around, and WP-6 projects has highest priority. There are also some topics that fits ongoing research at UMU. Such projects can benefit from available local expertise. Even if we keep the topic open in general we prefer topics related to the research profile of our university. Examples of such topics are: – Land-sea interactions, including effects of dissolved organic matter, nutrients, metals and freshwater on the coastal zone. – Climate change scenarios testing for effects of temperature, changed hydrography (stratification, turbulence and mixing) on biology and chemistry. This may from autumn 2018 include effects of ice cover. Transformation and propagation of Mercury, other metals, persistent organic pollutants and pharmaceuticals and their effect on the food web are also preferred themes. However, such projects require permission and/or equipment to get rid of the substances, which mean that we cannot guarantee that any such project can be performed. Studied objects are primarily part of the water column such as plankton, their biodiversity and major associated processes. However, mysids, smaller fish and natural bottom sediments can also be introduced in the mesocosms and subject to study. MF-UMSC offers open access to all infrastructure in the MF-UMSC for visiting scientists accepted through AQUACOSM TA activities. At least 208 person days for TA will be allocated to external users in 2018. We aim for 1-2 projects in 2018 with 4-8 participants. Visiting scientists can work on independent projects for up to 30 days, with the mesocosm hall and adjacent laboratory exclusively reserved for AQUACOSM. In addition, smaller groups are welcome to join other projects at MF-UMSC at any time. Indoor – pelagic – marine, brackish, (freshwater), 12 tanks of 5 m depth, 2 m3 volume. Outdoor- pelagic – marine, brackish, (freshwater), 24 tanks of 1 m3. Sediment may be added. Indoor: Temperature (-1o up to 30o C), stratification depth and strength, convective stirring at different rates, size fractionation of organisms in intake water down to 1 µm, time programs controls light intensity and spectra, adjustable air temperature above the water surface, ice freezing rate, ice thawing rate, adjustable water exchange, chemical parameters. Outdoor: size fractionation of organisms in intake water (300 – 1 µm), chemical parameters. Land-sea interactions, climate change, and impact of environmental pollution on organism stoichiometry and health, taxonomic composition, predator-prey interactions, food web processes and efficiency. Mercury biogeochemistry, Impact of dissolved organic carbon on plankton respiration, growth and food web function, Fish population models and migratory behaviour. 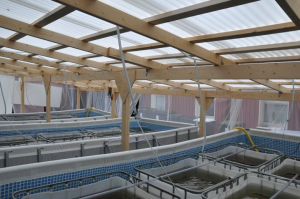 The Mesocosm Facility at Umeå Marine Sciences Center (MF-UMSC) has an indoor and an outdoor component (Fig. 6.9.1). It is located close to the seashore in the northern part of the Baltic Sea. The water outside of the field station is ice covered for 3-5 months a year, and brackish with a salinity around 3 PSU. The water intake to the indoor mesocosms is situated 800 m off-shore at 2 and 8 meter depths. The mesocosms can also be filled with sea, lake or river water transported from elsewhere. Filling can be done through filters of selectable mesh sizes, down to 1 μm, an semi-automatic water renewal system with controllable turnover rate are also available. The indoor facility consists of 12 cylindrical mesocosms with water columns 4.86 m high and 0.73 m in diameter (volume ca. 2 m3). Temperature can be controlled and manipulated in 3 different sections of each mesocosm. This enables for projects that require stratification, controlled convective stirring or both. The light sources are Valoya R-258 (Light DNA), especially produced with the aim to closely mimic the spectra of the sun. These lamps are handled by time-programs that controls spectra and intensity according to lattitude and time of day. Four freezers are installed on top of every three mesocosms, this enables control of the air temperature above the water columns down to -20o C. Projects that require ice can thus be carried out, and parameters such as freezing or thawing rate can be adjusted. This latter option allows for systematic seeding experiments. 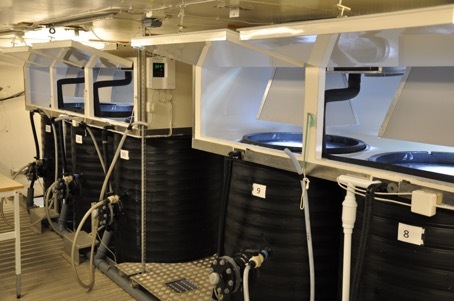 The ventilation of the mesocosm hall is controlled by the CO2 content in the room, allowing for natural controls in experiments where the CO2 content in the water is altered. The outdoor facility is available during summer. It consists of 4 large pools, each carrying 6 cubic mesocosms of 1 m3 (Fig. 6.9.1. right). The temperature is kept the same as in the water intake by using high rates of water flow through in the pools. Experimental designs can be supported by long-term ecological research time series of variables stored in an easily accessible database on the internet. 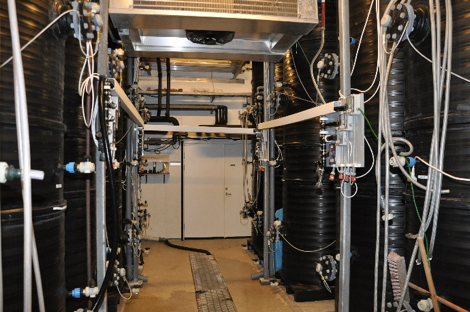 About 70 international researchers have used the mesocosm facility during numerous experiments conducted over the past 10 years. Outcomes include two publications in top-ranked scientific journals regarding methylmercury levels in coastal environments. Two Seaguard CTD equipped with PAR, conductivity, temperature, turbidity, Chlorophyll, Oxygen, CDOM and pressure sensors. Spectrophotometer, spectrofluorometer, scintillation counter, and basic laboratory equipment including salinity and pH meters. MF-UMSC offers open access to all infrastructure in the MF- UMSC for visiting scientists accepted through AQUACOSM TA activities. At least 624 person days in total for TA will be allocated to external users in years 2-4. Groups of 20 visiting scientists or more can work on independent projects for up to 30 days, with the mesocosm hall and adjacent laboratories exclusively reserved for an AQUACOSM project. Present research projects using MF-UMSC focus on effects of land–sea interactions and climate change on marine food-web structure and function, as well as on the origin, impact and remediation of anthropogenic environmental pollution. Services currently offered by the infrastructure: MF-UMSC provides the logistic support needed on site, including offices and 283 m2 of directly available laboratory space, an auditorium for 50 persons, a library and WIFI-based internet access. Two large aquarium halls with seawater flow-through options, 4 walk-in cold rooms, and seagoing research vessels as well as small boats are available. Some chemical and biological analyses may also be ordered. The direct connection of MF-UMSC with the Departments of Ecology and Environmental Sciences, Chemistry, and Molecular Biology also ensures access to additional analytical platforms in environmental and analytical chemistry and molecular biology, as well as expertise of a broad scientific community. Support offered under AQUACOSM: A dedicated person at MF-UMSC is responsible for the technical operation of the mesocosms during experiments. This includes testing of operational parameters, surveillance and maintenance of the facility before and during an experiment. A scientist at MF-UMSC is available to assist with the practical and scientific coordination of projects, assistance with chemical analysis is possible as well as support from our ship crew. Overall, this operation mode has proved effective since 2007. Our hostel is situated a few hundred meters from the field station. Ten rooms with two beds each are available as well as a large kitchen with fridges, freezer and cooking facilities. Additional accommodation and restaurants are also available in nearby Hörnefors.